Files Compare Tool 2.7 free download. Files Compare Tool is a visual utility for the comparison of files and directories. 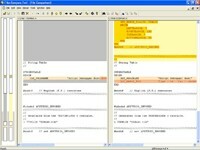 Files Compare Tool is a visual utility for the comparison of files and directories. It helps you to compare and merge different versions of the same textual file. A color-coded side-by-side comparison makes it easy to understand differences between two files at a glance, powerful editing engine helps you to merge found changes and edit text directly. Files Compare Tool has a number of simple and convenient features that many users have been expecting for a long time from a comparison program. FreeDiff is a freeware file viewer for Windows you can use to analyze the differences between the file revisions. VBA Code Compare allows you to compare and merge any Visual Basic code embedded into a VBA project (macros, sheet code, module code etc. DiffDaff offers easy comparison of files, folder comparison and the detection of differences between two web pages. Why? I use Windows explorer as my main file manager. F2F is a simple application to compare 2 files. The Free Database Compare software will allow you to compare the structure of two databases and display all the differences between them. DirCmp is a command-line software that will allow you to compare two directories and possibly their subdirectories. ICE Mirror creates or maintains an exact duplicate of the original directory. You can not even imagine how many copies of the same files you have!!! Solution needed? Here it is! DupKiller is the fastest and the most powerful tool for searching and removing duplicate files.